How to Be a Werewolf - Insurance isn't going to cover that. 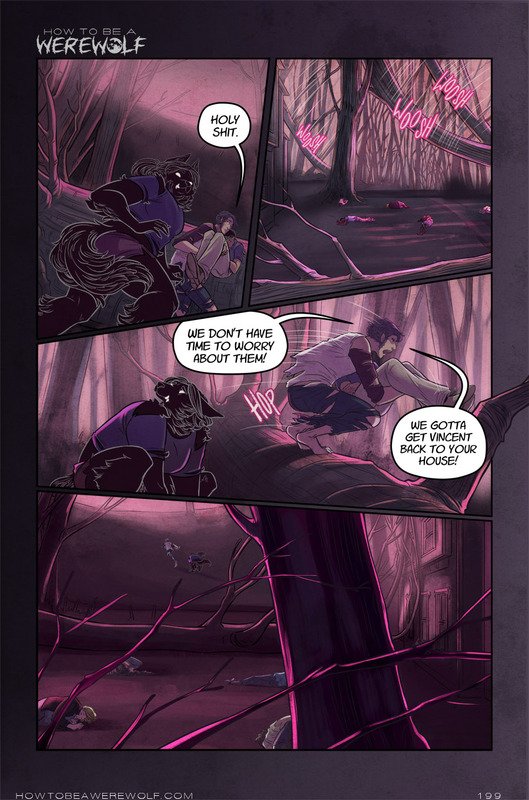 Vote over at Top Web Comics and you can see the least spoilery image I've got from next week's pages! Yay! Look at this page, isn't it neat? Wouldn't you say that it's really pink? Okay, that's an imperfect rhyme scheme, but I like it. Too bad I can't sing right now, because I've had a cold for a WEEK AND A HALF. I haven't been sick this badly, or this long, since high school. I've gone almost 13 years and not been sick like this. I flew to Los Angeles, expecting a super cool vacation, and most of it was pretty solid! (My rental car sucked, though.) But instead of spending a second day at Disneyland, I spent my last day languishing on the couch or bed of my AirBnB attempting not to puke up my guts. Then I woke up nice and early the next day and got on an airplane :D :D :D. I'm sure those people sitting near me are still in great health. Then, when I finally got back to where my damn car was parked, it was dead! Because in my delirium from having to wake up at 1am to get to the airport that day, I left my interior light on from when I was checking on something! But I got a jump from AAA, got home, and then had to get a new battery the day before Christmas because mine was toast. Neat! Then I had to stay up here for Christmas instead of visiting my aunt in Mississippi because I was too sick to drive down. Boo hiss. I'm going for New Years, though! I'm also going to the doctor today. Anyway, long story long, I thank you all for your patience with one page a week for these last two weeks of December! I desperately needed the break. Probably a lot more than I actually realized. I feel more refreshed working on next week's pages than I have in awhile! Since I started this comic back in February of 2015, I've never missed a single page or posted a day late, so I feel like this small break has been earned. And hey, I'm working up to my two year anniversary soon! That's terrifying, actually. A few people pointed out they thought the tree falling was Connie's way of keeping them from leaving. Maybe! That'll be somewhat clarified in next week's pages. Or more mystified, maybe. I feel like every time I bring Connie around again, I answer one thing and confuse everything else. So look forward to that! Okay, I'm going back to being sickly and finishing next week's pages early so I can go visit my family this weekend. Woo! If nothing else, my abs should be pretty impressive after all this damn coughing...which is great because I haven't been to the gym in a month. Kind of busy! Being sick, apparently.